Our gorgeous cover, by the wonderful Katy Shuttleworth. In Chicks Unravel Time, Deborah Stanish (Whedonistas) and L.M. Myles bring together a host of award-winning female writers, media professionals and scientists to examine each season of new and classic Doctor Who from their unique perspectives. This has been an incredibly exciting project, and I’m delighted to see it come together. There’re contributions from so many wonderful writers and a fantastic variety of essays in the book, exploring the series with intelligence, wit, humour and passion, and I can’t wait to share them. 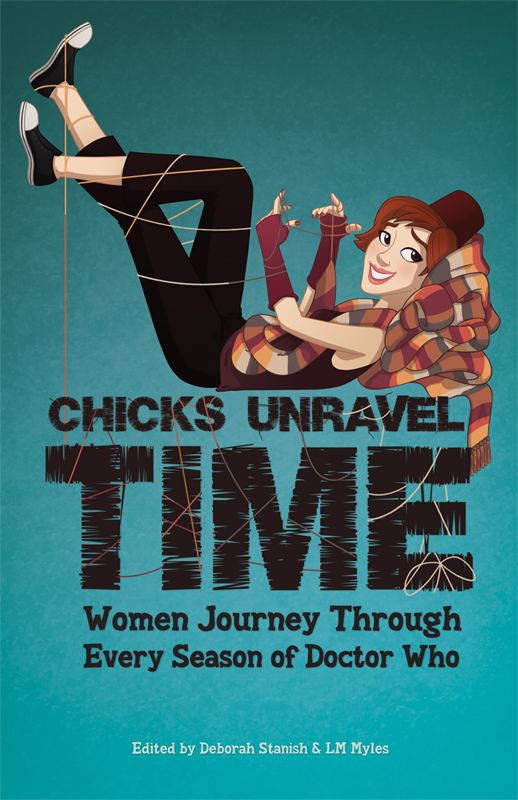 Chicks Unravel Time is currently available for preorder at Amazon.com and Amazon.ca. This is a very exciting post where I’m making a shiny RL blog thing to talk about writing and pro-ish projects and try and make, dare I say it, thoughtful posts as opposed to what I usually do when blogging. I hope those people who said nice things about WordPress weren’t fibbing to me. It all looks strange and different and I want that column on the right, darn it, the right! Presumably I’ll be able to work out how to do this. Or maybe I’ll be thwarted by the absurd temperature that’s currently going on here and my brain will melt. Oh there’s a wee word count! That’s quite keen. I like that.